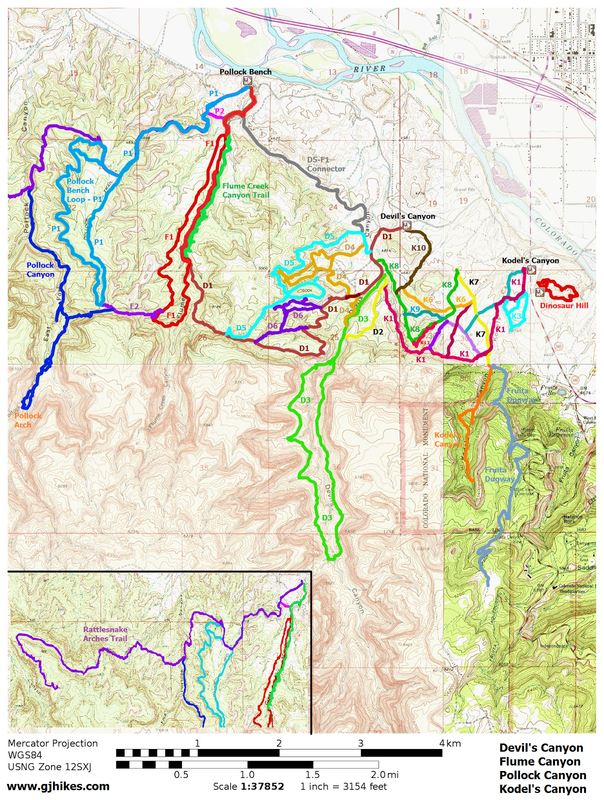 The K6 trail is located in the Kodel's Canyon Area of the McInnis Canyons National Conservation Area near Grand Junction and Fruita, Colorado. The upper end of the trail begins off of the K10 trail a short distance from where the K10 and K8 trails intersect while the lower end of the trail connects to the K7 trail at the same point as the K5 trail. Enroute the K6 trail crosses the lower end of the K8 trail. For this post we began at the Devil's Canyon trailhead to get to the upper end of the K6 trail. The route that we chose was to follow the K10 trail that leaves the parking area right behind the restroom. Another option would have been to follow the D1 trail to where the K8 trail begins and then hike up the K8 to the K10 and then go the short distance down the K10 to where the K6 begins. 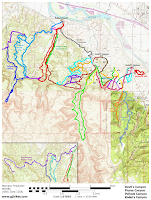 The map at the end of this post can be studied to plan your own route. As the trail starts out in this direction it climbs in and out of several small washes as it heads east. Distant scenic views looking toward Kodel's Canyon appear in several places. As the trail progresses it comes out on a small ridge above the K9 trail. Near the half mile point from where the K6 trail began it crosses the K8 trail. During the spring and early summer months the Kodel's Canyon area is awash in bouquets of colorful wildflowers like these Navajo fleabane. The trail comes to an end at its junction with the K5 and K7 trails. At this point you will probably have to look over your shoulder to see the K5 trail that you probably just hiked past without noticing. The map on the right can be printed and used to help decide where to hike to from here. As far as the K6 trail goes it is short and sweet. If you would like to see it for yourself then all you have to do is 'Take a hike'.